The Samsung Galaxy S10, Galaxy S10+ and the Galaxy S10e collectively represent the best technology that Samsung has to offer to consumers. But for all the goodness that they pack in, the devices do miss out on a small but meaningful feature: a notification LED. Since the front of the device (and the sides too) is occupied primarily by the display, there is very little room for an effective notification LED. Meet Holey Light, an app from veteran Android developer Chainfire that utilizes the space around the camera cutout on the new Samsung flagships to emulate a notification LED. Holey Light animates the display area immediately surrounding the camera cut-out as a replacement for the missing notification LED. It lights up the area only if the notification would have otherwise triggered the non-existent LED to light up. The app is limited to only the three Samsung flagships, and will crash if you try to use it on other devices with a punch-hole display or camera cutout. The app is completely free and without ads, and is open-source as well (and licensed under the GPL v3). The app works when the screen is on, and when the screen is off and the phone is charging. Chainfire mentions that the app fakes the screen being off, so there may be oddities that appear occasionally. The animation does not show on the lockscreen since it is not possible to draw on the lockscreen. Holey Light does not currently work when the screen is off and the phone is unplugged. This is because the app in its current state would keep the device awake (and most of the screen off) to emulate the LED, which is enough of a power draw to drain the battery on your device. Chainfire is exploring solutions to this, but since this requires extensive testing, you may have to wait for a while. Since the app is open sourced, you can recompile it with this feature enabled if you wish to try it out now. 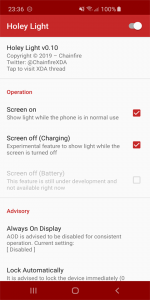 The post Holey Light turns the Samsung Galaxy S10/S10e/S10+'s hole punch into a notification LED appeared first on xda-developers.